The Securities and Exchange Commission last week abolished the special regulatory program that it applied to Wall Street's largest investment banks. Known as the "consolidated supervised entities" program, it relaxed the minimum capital requirements for firms that submitted to the commission's oversight, and thus, in the view of some experts, helped create the current global financial crisis. But the SEC's decision to ax the program currently affects no one, since three of the five firms that voluntarily joined the program previously collapsed and the other two reorganized. The decision came last Friday, one day after the commission's inspector general released a report (PDF) detailing the program's failed oversight of Bear Stearns before the firm collapsed in March. The commission's chairman, Christopher Cox, a longtime opponent of industry regulation, said in a statement that the report "validates and echoes the concerns" he had about the program, which had been voluntary for the five Wall Street titans since 2004. The report found that the SEC division that oversees trading and markets was "not fulfilling its obligations." "These reports are another indictment of failed leadership," said Sen. Charles Grassley (R-Iowa) who requested the inspector general's investigation. 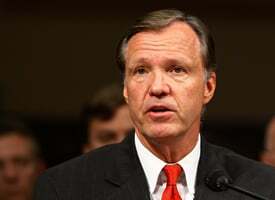 The SEC program, approved by the commission in 2004 under Cox's predecessor, William Donaldson, allowed investment banks to increase their amount of leveraged debt. But there was a tradeoff: Banks that participated allowed their broker-dealer operations and holding companies to be subject to SEC oversight. Previous to 2004, the SEC only had authority to oversee the banks' broker dealers. But the 2004 "consolidated supervised entities" program revoked these limits. The new program also eliminated the requirement that firms keep a certain amount of capital as a cushion in case an asset defaults. As a result, the oversight program created the conditions that helped cause the collapse of Bear Stearns. Bear had a gross debt ratio of about 33-to-1 prior to its demise, the inspector general found. The inspector general also found that Bear was fully compliant with the programs' requirements when it collapsed, which raised "serious questions about whether the capital requirement amounts were adequate," the report said. "The SEC gave up the very protections that caused these firms to go under," Pickard said in an interview with ProPublica. "The SEC in 2004 thought it gained something in oversight, but in turn it gave up too much public protection. You don't bargain in a way that causes you to give up serious protections." The previous program "had an excellent track record in preserving the securities markets' financial integrity and protecting customer assets," Pickard wrote in American Banker this August. The new program required "substantial SEC resources for complex oversight, which apparently are not always available." Asked if he believes the 2004 program was a direct cause of the current crisis, Pickard told ProPublica, "I'm afraid I do." The New York Times reported Saturday that the SEC created the program after "heavy lobbying" for the plan from the investment banks. The banks favored the SEC as their regulator, the Times reported, because that let them avoid regulation of their fast-growing European operations by the European Union, which has been threatening to impose its own rules since 2002. A SEC spokesman declined to comment for this article, referring inquires to Chairman Cox's statement. In the statement, Cox admitted the program "was fundamentally flawed from the beginning." But Cox, a former Republican congressman from California, offered mild support for the program as recently as July when he testified before the House Committee on Financial Services. The program, among other oversight efforts, Cox said, had "gone far to adapt the existing regulatory structure to today's exigencies." He added that legislative improvements were necessary as well, and has since told Congress that the program failed. So why did the commission not end the program sooner? Some say that the program's flaws only recently became apparent. "As late as 2005, the program seemed to make a lot of sense," said Charles Morris, a former banker who predicted the current financial crisis in his book written last year, The Trillion Dollar Meltdown. The SEC "didn't know it didn't work until we had this stress." In his recent statement, Cox said the inspector general's findings reflect a deeper problem: "the lack of specific legal authority for the SEC or any other agency to act as the regulator of these large investment bank holding companies." Secretary of the Treasury Henry Paulson has called for a refining of the regulatory structure to reflect the global and interconnected nature of today's financial system. In any case, the program's failure can be seen in the disappearance of the participating banks: Bear Stearns, Lehman Brothers, Merrill Lynch, Morgan Stanley and Goldman Sachs. Merrill Lynch's leverage ratio was possibly as high as 40-to-1 this year and Lehman Brothers faced a ratio of about 30-to-1, according to Bloomberg.